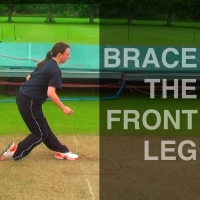 One of the most common pieces of advice from top bowling coaches is to learn to "brace the front leg". But that's a technical term, and it's not obvious to everyone what it means, or how to do it. 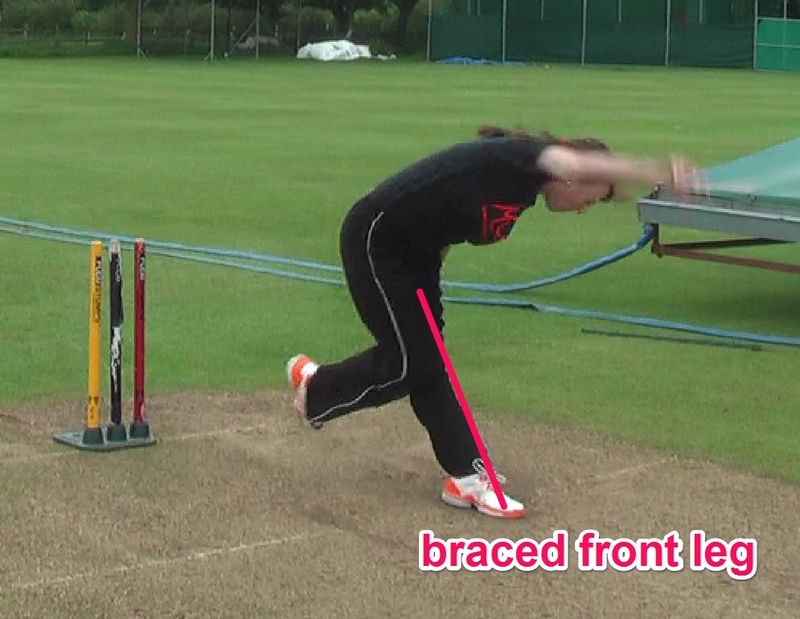 So, here are more details about how and why you brace the front leg to bowl fast. Why brace the front leg? A pole vaulter generates enough power and energy to get over a bar five or six metres in the air. Much higher than a high jumper. The difference is the pole, which is used to brace against the ground after a run up, put energy through the pole and lever the athlete high in the air. The idea is becoming more popular in coaching - thanks in no small part to Ian Pont - but it's still not standard practice. That means many players learn how to bowl without ever being told to brace the front leg for improved pace with no loss of accuracy. In fact, there are even professional bowlers who don't brace the front leg. Even very quick bowlers, who often use other methods such as upper body power to bowl fast. However, chances are you will bowl faster whatever you method if you brace. This is a huge advantage for you can get an extra yard of pace if you can learn the skill well. You may or may not become a 150kph bowler just by bracing, but you will certainly get quicker and you won't lose accuracy. This is true, even if you have an established action with a bent front knee. The first step is to check if you knee bends when your front foot lands. If it does, you need to do some work. So, get yourself on video from the side and see for yourself. If you do need to brace, this skill is difficult to learn. It's especially tough if your action is well set. It feels "wrong" when you try it. It may even feel like you are going to damage your knee by locking it. This feeling won't last long if you persevere. Don't let it put you off. Take some time to try bracing your front leg (also called the front foot block) from standing still. You don't even need to bowl a ball. Get a feel for that braced leg in a still position first. It takes more time for some than others but everyone gets it. Then you can try walking it through slowly and building it up to a jog then full speed. You can see the full drill progression here. For some, this will come easily and you will see an uptick in speed. For others it takes more time but with effort you can get there and add speed whatever your starting point. This is a very nice article about front foot block. Same technique is used in javelin throw which is quite similar to bowling. I have been practicing this since last 3-4 months now. Still getting used to it as my action was well set since many years now. However, I never had any problem with side strain but ever since I started employing the front foot block, I have been getting side pain. Any comments? ?